See winners and answers below. The game is simple. Find the 11 Lord of the Rings items, things, people, or places from the clues below, then figure out the final answer to the puzzle. This contest is CLOSED. Look under the grass near Mirror mere to find what slew the dwarf. (arrow) You'll find the story of the slain dwarf in the book the Fellowship read in Moria. Look up the pass to find the eyeless, insubordinate orc. (Radbug) Shagrat mentioned murdering this little orc in the Tower of Cirith Ungol. Look behind the hedge for the wasted produce. (apple) Sam hit Bill Ferny, who was standing behind a hedge, with an apple. Go to the bottom of the Hill, on the western side, to pass through it. (gate) Three hobbits passed through it when leaving Hobbiton on the way to Crickhollow. Find the fang in the ring. (Orthanc) The Tower of Orthanc was know as Mount Fang, and it sat within the stone ring of Isengard. Find the birdlike Shirriff. (Robin) Robin Smallburrow met the four hobbits as they returned to the Shire. 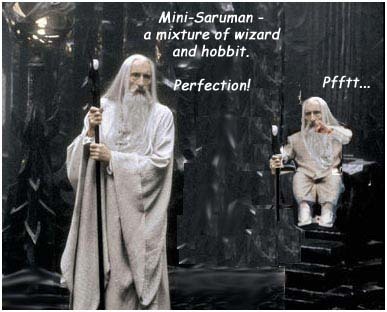 A wizard keeps it hidden. (Narya) Gandalf held this Ring of Power secretly. He�s in Gollum somewhere. (Sm�agol) The original personality lurked inside the treacherous creature. Ask Gimli for the item with the white horse on a green field. (shield) The dwarf chose such a shield while in Rohan. You�ll likely find it under a Swerting. (oliphaunt) In Ithilien, Sam recalled hearing tales of Swertings in the Sunlands riding these huge animals. Find Fram�s toothy jewelry. (necklace) From the appendices, Fram slew the dragon Scatha and sent a necklace of its teeth the Dwarves. The Maps of Tolkien's Middle-earth by Brian Sibley and John Howe. Four beautifully painted maps by John Howe, plus an 80-page hardcover book giving accounts of how the original maps came into being. A choice of one of these three books. New writings on the worlds of J.R.R. 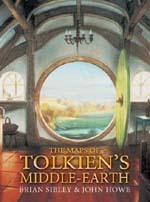 Tolkien by many well-know authors. We did have a lot of close answers. Several people got as far as Aragorn's Son, but didn't take it to the final answer. Still others got many of the clues, but they didn't figure out to use the first letters to solve the puzzle. One person just outright guessed BARROWDOWNS because it had 11 letters! (Tricksy, but even if it had been right it would not have won because it didn't have a 'brief explanation') Sadly, we did have several people surreptitiously send in multiple answers. We threw those out immediately, of course. Thanks to everyone who played. We hope you had fun.